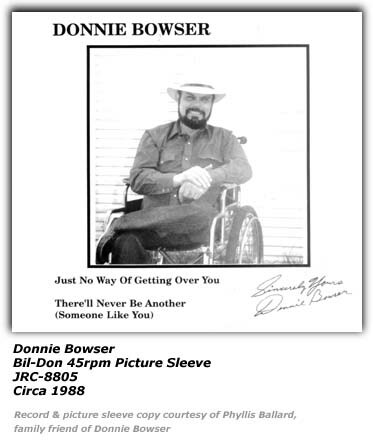 Donnie Bowser was the name that country music fans knew him by. But his real name was Donnie Bowshier; he lamented that he changed the spelling because the disc jockeys had trouble pronouncing his name correctly. He was a native of Madison Mills, Ohio, a town southwest of Columbus along route 62, and really never strayed much from his Ohio roots during his long career. But his life was not your typical life of a country music singer. When he was just three years old, he had a polio attack. It may have left him handicapped, and facing the world from a wheel chair, but that did not deter his musical aspirations. He grew up in a musical environment. His father, Odes Bowshier, was a fiddle player. His grandfather, Clifford Bowshier, played the banjo. And undated article in Hillbilly Researcher notes that he started his musical interests when he was about twelve years old. In 1950, when he was just thirteen years old, he formed his own band that was known as the JR Melody Boys. The group included Paul Hopkins on lead guitar, Walt WIlson on the steel guitar, Charlie Gore on fiddle, Zeke Turner on rhythm guitar along with his brother, Roger, on the bass. The JR Melody Boys did the usual personal appearances in the local venues; their popularity and name came to the attention of the King Record label and earned them a recording contract in 1953, when Donnie was about 16 years old. They went to Cincinnati, Ohio to do their first two recordings with King that were released on the Skip record label that King owned. The vocals were credited to a fellow by the name of Slim Redman. In April of 1953, the group went back to the King studios and cut another four tunes. One tune, "Bullfrog Boogie" was credited to Earl Slone and the Melody Boys, but the others were gave the credits to Donnie Bowshier. 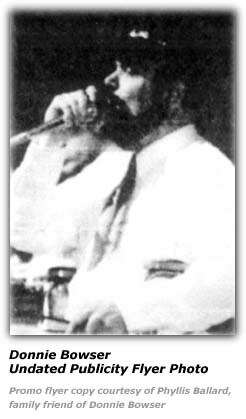 Graham and Pauline Fincher, who wrote the article in Hillbilly Researcher, mused whether the Charlie Gore that played fiddle for Donnie was the same Charlie Gore that recorded for King in the 1950s and was on the Midwestern Hayride show over WLW. We might also wonder if Zeke Turner was another name associated with Donnie in his first group was the same Zeke Turner on WLW in the 1950s as well. Having those two names in Donnie's first band when he was just barely a teen-ager may give some indication of his talents at that early age. 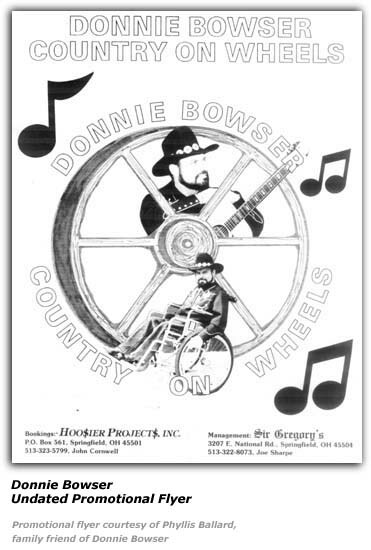 Donnie's musical career took another turn in 1955 when he inked a deal with the Dess record label based in Wilmington, Ohio. Later that same year, he formed a new group known as the Radio Ranch Boys. That group incldued Donnie on lead vocals and rhythm guitar; Homer Wooten on lead guitar; Sonny Curtis on the steel guitar; Roger Bowshier on bass and Gene Sisco on vocals and fiddle. Browsing old fan club newsletters will usually provide a surprise or two from that era as they would often provide short features on other artists of the day. Some were willing to give a bit of notice to the up and coming artists trying to get some exposure. One such newsletter was the Melody Trails newsletter published by Ernest Tubb's fan club. In their September 1955 issue, they included a short feature on Donnie. One of the details we learn is the makup of the JR Melody Boys at that time. Paul Hopkins was his guitar player and was only 17 years old. Ray Knap was his steel guitar player and was 24 years old while the bass fiddle player was his 16 year old brother, Roger. That 1955 article goes on to note that Donnie and the boys had been on radio station WJEL in Springfield, Ohio for three years and were associated with radio station WONE in Dayton through a summer and fall one year. Donnie and the JR Melody Boys also appeared several times on the Kenny Roberts show. Early in 1955, the group was in Nashville and were guests on the Ernest Tubb Midnight Jamboree. Mr. Tubb was well known for giving the younger talents a chance to be heard and his show over a powerful clear channel radio station allowed those struggling artists to be heard far and wide. During that visit, he also appeared on Ferlin Husky's early morning show over WSM as well. Later on, the band also included a disc jockey by the name of Sam Salyer who was being heard over WCHO in Washington Court House, Ohio. That was the group that went into the recording studios in 1956 to record a couple of songs. One was "Rock and Roll Joys" and the other would become long associated with Donnie, "Stone Heart". During that session, Gene Sisco did a number called "Grandma Rock and Roll" for Dess as well. Sam Salyer was listed as co-writer of "Stone Heart" along with Donnie. Donnie and his band did many personal appearances around Ohio. They also did many appearances with Hardrock Gunter and the WWVA Jamboree show. To melt your Stone Heart. "Stone Heart" caught on with the audiences. So much so, that in 1957, Donnie regrouped and formed a new band that he named the Stonehearts. That artcile the Finchers wrote noted that band members included Ronnie Carpenter on guitar; Roger Bowser on bass and seemingly another one of his brothers, Terry Bowser on drums. It was at this time he decided to change his stage name to Bowser because the disc jockeys were not consistent in pronouncing his family name. Before he was even 21 years old, he found himself doing his own weekly television show over Channel 22 in Dayton, Ohio. Donnie and the Stonehearts also found themselves recording for the Sage record label in 1957. In one session, he re-recorded two tunes, "Stone Heart" and "I Love You Baby". "Stone Heart" proved to be a popular song and found its way on several other labels for Donnie. In an undated article for the Sprinfield News-Sun, he tells her about that recording of "Stone Heart". "I recorded it on Sage and it was so successful that they took me to Nashville and recorded it on another label. It did well again, so they just kept on releasing it on other labels." But in spite of the popularity of his recordings, Donnie decided to leave the music behind for a while. He grew a bit disenchanted with the obstacles he faced as a handicapped person in the entertainment industry and on the road. But he the early 1960s found him back in the music business, recording for the Bamboo label as well as the JD label otu of Nashville, Tennessee. In 1965, he did his first album for the Top Tenn label and was recorded at the Megacity Recording Studio based in Dayton, Ohio. Again, he seemed to disappear from the recording arena for a long spell until fans heard him again in 1972 on the Stop record label. 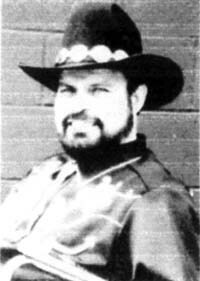 This time, his career saw him doing appearances on the famed WSM Grand Ole Opry in Nashville as well as the Cowtown Jamboree in Fort Worth in 1970. In fact, he hosted that Cowtown Jamboree show for a time. He continued to reccord for various other labels during this time. He continued his career and had another release in 1987 on the Bil-Don label. The Finchers noted that while his recording of "Stone Heart" sold relatively well, he had not had a record appear on the charts. But in 1989, that changed when he found himselve doing a release on the Playback Records label based in Miami, Florida for their Ridgewood subsidiary. On September 16, 1989, "Falling For You" mad its appearance on the Billboard Hot Country Singles chart at number 90. Later on, he went back to the recording studio and cut another album that included a special guest on a couple tracks, Bobby Bare. 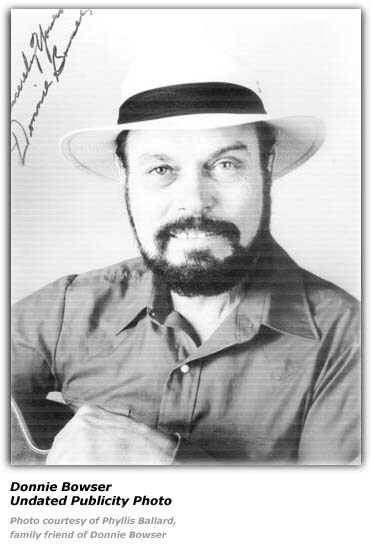 Around 1991, when he was 54 years old, he did a benefit concert at the Springfield "Freedom Road Center". The show was to raise funds to buy computers for the area schools. He also did a New Year's eve concert at the Clark County Fairgrounds. Other artists that appeared on that show were Kent Westberry and the Memory Makers and Freddy Weller, who had a few hits in country music as well, both as a solo artist and with Paul Revere and the Raiders. It's interesting to note that ticket prices back then for that New Year's Eve concert were only $17.50. Andrew McGinn wrote in his obituary article for Donnie in 2002 that Donnie had told of one of his memorable moments during an interview a couple of years prior to that time. He was doing a show with George Jones in Columbus, Ohio. He was doing the classic tune by Arlie duff, "Y'All Come". It seems he got caught up in the revelry a song like that will do and well, as he explained it, he titled the wheels of his wheelchair back, trying to do a 'wheelie'. But he may have put too much energy in to the move and just like that his chair went straight back and he was suddenly on his back and being the trouper he was, finished the song on the floor, flat on his back and his wheels probably spinning right along. During the 1950s and 1960s, Donnie shared the stage spotlight with many of the stars of that era including Ernest Tubb, Mel Tillis, Hank Williams, Jr., Bill Anderson, Jim Ed Brown, Bobby Bare, Johnny Paycheck, Minnie Pearl, Connie Smith, Ray Price, Faron Young and on the list goes. Donnie passed away suddenly in 2002 of a heart attack. Carol Simmons wrote in the Dayton Daily News in March of 2002 that between 1,200 and 1,500 family, friends and fans went to pay their respects to Donnie at the funeral home in Springfield, Ohio. His son Gene noted at the time of his passing that his dad would often appear with his band and as you might expect, promptly stole the show. When Donnie passed away, he left behind his wife of 34 years, Ann (Booth); ten children and their spouses, 29 grandchildren and 17 great grandchildren, two brothers, Ronnie and Roger.